Leaving the screening of Me and Earl and the Dying Girl, I declared that this is already one of my favourite movies, something that the publicists seemed delighted to hear. I was literally feeling abuzz from the film, and I’m sure my excitement was palpable. Now that might sound like hyperbole, but in this case you should absolutely believe the hype that has been accumulating since this independent dramedy took home both the Grand Jury Prize and Audience Award at Sundance in January. It’s simply that good, and one of those rare films that manages to be both extremely entertaining and genuinely emotional. The first character in the title is Greg Gaines (Thomas Mann), an awkward high schooler with a devoted mother (Connie Britton) and eccentric professor father (Nick Offerman), and a house full of movie memorabilia. Greg is the sort of kid who tries to be a part of every social group, so that he doesn’t have to commit to any of them, preferring to call his best friend Earl (RJ Cyler) his co-worker, for the movies they make together. They eat lunch in the office of their teacher, Mr. McCarthy (Jon Bernthal), who lets them use his computer to watch classic films. The titular dying girl is Rachel Kushner (Olivia Cooke), a classmate who has just been diagnosed with leukaemia. Greg hasn’t really spoken to her since kindergarten, but his mother thinks it would be good for the two of them to hang out, and her mother (Molly Shannon) immediately embraces him with open arms. Although Greg warns us that “this isn’t a touching romantic story,” the close friendship that develops between him and Rachel is incredibly moving to observe, as she finds unexpected joy in watching his films, and helps him find more confidence as he tries to make a film specifically for her. Thomas Mann delivers phenomenal work here, running the gamut from charming and funny in an awkward sort of way, to being openly emotional and completely honest. Although already a recognizable face from other films like Project X, this is a star making performance for him, that is perfectly matched by lovely work from Olivia Cooke. A single take scene that lasts for several minutes, where they look towards the camera instead of making eye contact, with her sitting in the foreground and him standing in the background, is one of the most beautifully performed sequences of any film this year. Newcomer RJ Cyler rounds out the exceptional young cast, delivering memorable supporting work that could easily provide a major breakthrough for the first time actor, who brings both humour and unexpected emotional resonance to his scene stealing role. These three performances instantly cement the title trio of Me and Earl and the Dying Girl as some of the best young talents around. Nick Offerman, Connie Britton, Molly Shannon and Jon Bernthal all flesh out the supporting cast with some wonderfully nuanced work, each of them bringing remarkable depth to their few scenes. Director Alfonso Gomez-Rejon has crafted a film that beautifully balances the comedic and dramatic scenes, while displaying an equally memorable sense of style throughout. This is the work of a young filmmaker who is unafraid of experimenting and trying new things, and that’s both refreshing and exciting to see. The cinematography is endlessly impressive, using elaborate long takes and capturing things from clever angles, including a couple of scenes that literally turn the camera sideways. There are even a few brief moments of stop motion animation, quirky touches that work quite well in context. Every scene is brimming with its own unique sense of style, at once feeling like both an homage to other filmmakers, and something entirely unique unto itself. The work of auteurs like Wes Anderson and Michel Gondry are clear influences behind the film, and even the name of their house pet, who is affectionately called Cat Stevens, could be seen as a throwback to Hal Ashby’s Harold and Maude. The film seamlessly mixes together all of these styles and influences, even working in clever nods to Martin Scorsese and Werner Herzog, while offering a movie lover’s dream of references to past cinematic classics, including ample product placement for the Criterion Collection. With so many things being paid homage to, the fact that Me and Earl and the Dying Girl still manages to feel so original is another one of its greatest achievements. Greg and Earl’s homemade adaptations of some of their favourite films are sure to delight cinephiles in the audience, including such amusing gems as The Seven Seals, A Sockwork Orange and 2:48 PM Cowboy. Along with a truly witty script, which is filled with sharply written observations and memorable dialogue, these hilarious parodies provide some of the biggest laughs, and allow the bright personalities of these characters to really come alive. It’s also interesting to note how screenwriter Jesse Andrews has adapted his own novel for the screen. I enjoyed reading his book as well, but parts of the story felt cruder and less fleshed out on the page, including a more cynical protagonist and sections written in “convenient script format,” and a markedly differently last act. I think this is a fascinating adaptation for the ways that the story is allowed to play out a bit differently onscreen, offering the rare adaptation that expands upon the original material in the best possible ways, altering the course of the finale to have more of an impact onscreen. Yes, some harsher critics might just write this off as another self aware indie comedy, but Me and Earl and the Dying Girl does a remarkable job of subverting those stereotypes, and becoming something much more sincere than that. This is a film that is bursting with heart and characters who genuinely earn our sympathy, using humour to offer a believable look at a teenager forced to confront mortality and grieve in the only way he knows how. And when our tears are allowed to flow freely at the end, the response feels warranted because of how much we have come to care about these people. The final few scenes, which forego actual dialogue and are just set to voiceover narration and Brian Eno’s music, have an absolutely devastating emotional affect. It’s a beautiful stylistic choice that has stuck with me long after leaving the theatre, symbolizing the undying power of cinema to have a deeply felt impact on the viewer, and providing a moving metaphor of how we can continue to learn new things and hear new stories about someone, even after they have passed on. What more can I really say? 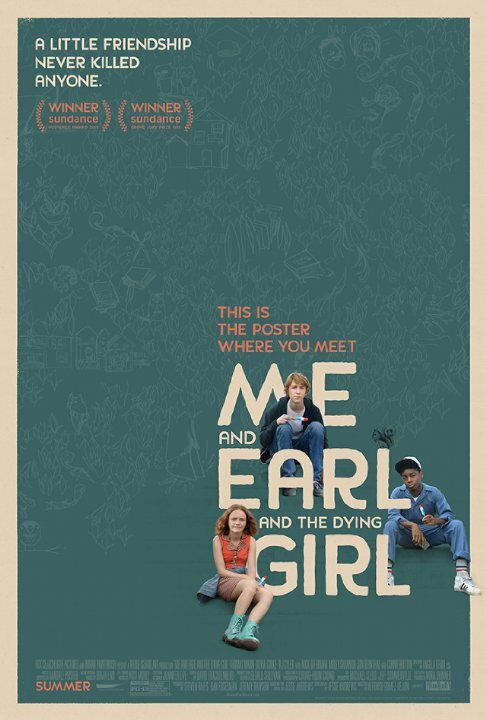 I laughed and cried and loved every scene of Me and Earl and the Dying Girl, and that’s about the highest praise I can offer this supremely entertaining and guttingly bittersweet film, which has already been added to my long list of favourites.